Engineering and Technology 10(1), 2019, pp. 261–276. sophisticated tricks, lumpen and organized actions . exclusive economic area of each country . maritime security in the region and globally . forecasting up to 2025 is proposed, solutions to mitigate piracy activities are proposed. crimes all play a role in piracy . making money with pirates has become a career to earn a living . legitimate career in the future. flagship government to ensure that any legal procedure is met . fishing which the international community has turned a blind eye in Somalia waters . Institute for Security Research warned- because this problem has never really disappeared. are still involved in other types of criminal activity, such as drug smuggling. world, Guinea Bay recorded 7 incidents . dangerous weapons and often use ships which are large enough to take the loot. Malacca Strait is considered one of the most popular high-speed maritime routes in the world. million tons of goods and pirates also operate very aggressively in this area . members were seriously injured . attack was very close to the position of the 689 Sunrise ship which is robbed in October 2014.
vessels operating through this area. Sabah State - Malaysia and the Philippines. attacked in southern Philippine waters in October 2016.
shippers equipped their ships with barbed wire, cannons and armed guards, as well. according to Beyond Piracy Ocean. the number of piracy cases occurred on the Guinea Gulf region and the Indian Ocean. attack smoothly on an oil tanker, they can earn two million dollars . of only 1 death and 304 people taken hostage . climb the ship and get on deck. exceptions need to consider. The criminals were hiding on one side of the ship in a small boat. territorial waters or not. The sailors were defeated; the ship was controlled by pirates . sailors and the ship were released. piracy on Somalia's mainland. This allows for the ultimate destruction of pirate lairs . them and to protect them on the most dangerous stages of the journey. limited control of competent forces, this is the area where many pirate gangs are concentrated. Indonesia and Malaysia are 2 out of 3 countries in the “hot area” which are not a member. international community's cooperation to prevent piracy rising in the region . to combat activities of piracy and armed robbery of ships in Asia . focal points when necessary about clashes with pirates or armed robbers against boats . issue alarm alerts to all vessels in the area . the national laws and regulations of the relevant signatories. building in order to aims to lower initial costs and protect the ocean environment. and armed robbery has not been effective . fastest way to save ships and victims [66-68]. information sharing against piracy, joint patrol ... and have been achieved certain results. strictly controlling the source of labour and goods markets in regional countries. A. T. Hoang and V. V. Pham, “A review on fuels used for marine diesel engines,” J.
Mech. Eng. Res. Dev., vol. 41, no. 4, pp. 22–32, 2018. Australas. J. Environ. Manag., vol. 25, no. 1, pp. 62–85, 2018. A. Demirbaş, “Global Renewable Energy Resources,” Energy Sources, Part A Recover. Util. Environ. Eff., vol. 28, no. 8, pp. 779–792, Jul. 2006.
diameter,” Biofuel Res. J., vol. 5, no. 3, pp. 863–871, 2018.
fossil gasoline,” Int. J. Mech. Mechatronics Eng, vol. 18, no. 2, pp. 97–103, 2018.
marine environment pollution,” Int. J. e-Navigation Marit. Econ., vol. 9, pp. 35–49, 2018.
and toxic heavy metal from maritime pollution by a new absorbent material,” J. Mar. Eng. vol. 5, no. 1, pp. 751–752, Mar. 2018.
consideration as the alternative fuel,” Int. J. Adv. Sci. Eng. Inf. Technol., vol. 8, no. 6, pp. Energy Sources, Part A Recover. Util. Environ. Eff., vol. 40, no. 22, pp. 2648–2659, Nov.
recovery,” J. Mech. Eng. Res. Dev, vol. 41, no. 2, pp. 92–96, 2018. Appl. Energy, vol. 231, pp. 138–166, 2018.
emerging biofuels feedstocks,” Biofuel Res. J., vol. 5, no. 4, pp. 894–899, Dec. 2018. Terrorism in Africa, South Asia, and Southeast Asia.” Taylor & Francis, 2018.
polygonal ship domain and reflect human experiences in estimating dangerous area,” Int. J. e-Navigation Marit. Econ., vol. 4, pp. 97–108, 2016. Indian Ocean (1994–2017),” J. Transp. Secur., pp. 1–18, 2018. UiT Norges arktiske universitet, 2018. S. C. Brown and T. J. Holt, “12 Identifying paths forward in the study of piracy,” Digit. Piracy A Glob. Multidiscip. Acc., p. 250, 2018. G. Burruss and C. Dodge, “10 The criminality of digital piracy,” Digit. Piracy A Glob. Multidiscip. Acc., p. 208, 2018. Crim. Justice Regul. Revisit. Essays Honour Peter Grabosky, p. 109, 2018.
avoidance of maritime piracy,” J. Mod. Afr. Stud., vol. 56, no. 1, pp. 5–30, 2018. Student Law Rev., vol. 3, 2018. Maritime Counter-Piracy,” IEEE Syst. J., 2018. Symposium (IGARSS), 2011 IEEE International, 2011, pp. 249–252. SOUTHEAST ASIA?,” J. East Asian Stud., pp. 1–11, 2018. Malaysia‟s Options,” J. World Trade, vol. 52, no. 3, pp. 461–477, 2018.
vol. 1, pp. 85–98, 2014.
seeking,” Int. J. Prod. Econ., vol. 206, pp. 184–195, 2018. Between Social Learning and Self-Control on Software Piracy,” Soc. Sci. Comput. Rev., p.
formality and informality,” in Digital Piracy, Routledge, 2018, pp. 66–94. pyrolysis for production of biofuels,” Biofuel Res. J., vol. 5, no. 4, pp. 872–885, Dec.
agricultural residue of Vietnam,” Energy Sources, Part A Recover. Util. Environ. Eff., vol. 40, no. 3, pp. 312–319, 2018. J. Corwin, “Preventing Pirated Software Use within an Organization,” 2018. 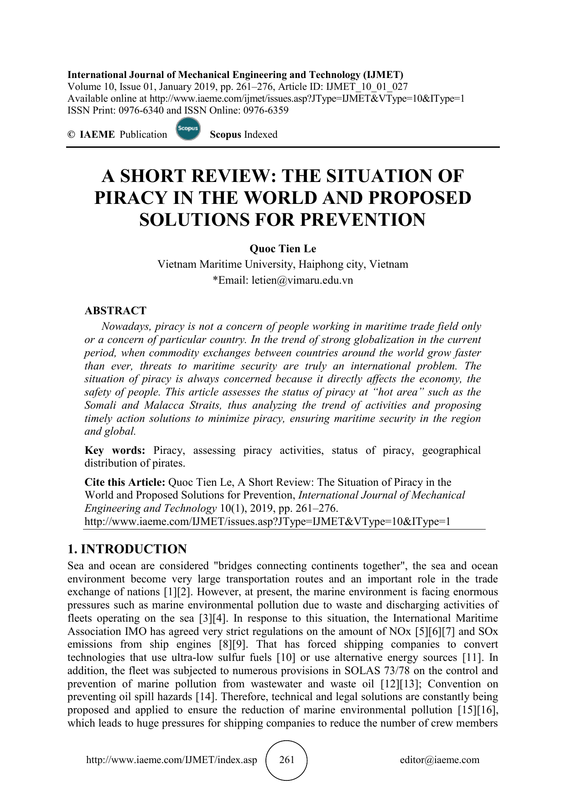 V. Re, “4 Anti-piracy policies and online film circulation,” Digit. Piracy A Glob. Multidiscip. Acc., p. 52, 2018. EUNAVFOR Atalanta,” Contemp. Polit., pp. 1–21, 2018.
security multilateralism,” Pacific Rev., vol. 31, no. 4, pp. 460–479, 2018. Security,” Monde chinois, no. 2, pp. 12–24, 2018. Partnerships (PPP) for Information Sharing,” in Security by Design, Springer, 2018, pp. Governmental Policy,” J. Marit. Stud. Natl. Integr., vol. 2, no. 1, pp. 45–57, 2018.
biodiesel properties on a diesel engine fuel supply system,” J. Mar. Eng. Technol, 2018.
chamber deposit formation,” J. Mech. Eng. Res. Dev., vol. 41, no. 4, pp. 17–21, 2018. Fuel.,” Int. J. Automot. Mech. Eng., vol. 15, no. 1, pp. 5110–5125, 2018. “Measurement and prediction of the density and viscosity of biodiesel blends,” Int. J. Technol., vol. 9, no. 5, pp. 1015–1026, 2018.
popular 4-stroke motorcycle engine running on biogasoline and mineral gasoline,” Renew. Energy Focus, vol. 28, pp. 47–55, 2019.
the weld mechanical properties: Design and fabrication,” Int. J. Mech. Eng. Technol., vol. 9, no. 6, pp. 496–506, 2018. Tempering Temperature on the Microstructure Transformation of Cu-Ni-Sn Alloy,” Int. J.
Mech. Mechatronics Eng., vol. 18, no. 04, pp. 27–34, 2018. Determining Intentions to Engage in Digital Piracy,” 2018. Capacity of the Singapore Strait,” 2018. S. H. CHING et al., “Lighthouse Memories-Malacca-The Main Road,” 2018.
framework,” Int. J. Prod. Econ., vol. 195, pp. 168–185, 2018. Somalia‟s piracy for ransoms,” Int. J. Law, Crime Justice, vol. 52, pp. 155–164, 2018.
preheated Jatropha oil and fossil diesel fuel,” Biofuel Res. J., 2019.
porous polymer,” Energy Sources, Part A Recover. Util. Environ. Eff., vol. 40, no. 8, pp.